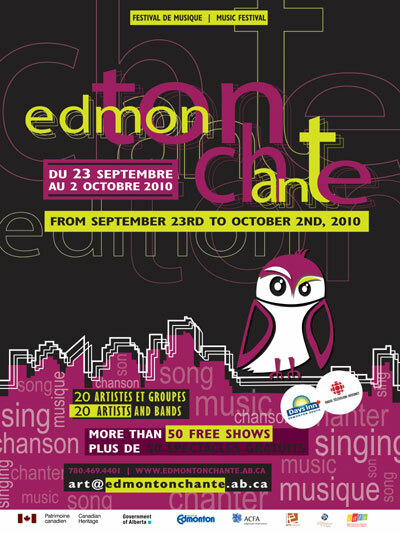 The official artistic program for the 2010 edition of the Edmonton chante festival has been unveiled! 61 shows will be presented free in Edmonton (Alberta - Canada). From world music to folk, through pop, rock, indie and hip hop, Edmonton Chante, francophone major musical event in Alberta, offers a very diverse program. For its seventh edition, the Edmonton chante festival will last ten days to expand its programming on two full weekends. From September 23 to October 2, 2010, a multitude of venues (cafes, bars, bistros and restaurants), located in Old Strathcona (Avenue Whyte), are preparing to host the festival in Edmonton. The band Allez Ouest are appointed spokesmen official of the 2010 Edmonton chante festival, ((Mireille Moquin, Joel Lavoie, Jason Kodie)) and Robert Walsh will represent the festival’s media.